We adopted this bunny from a veterinarian. The bunny was a rescue and found on a busy city street in Raleigh, North Carolina. 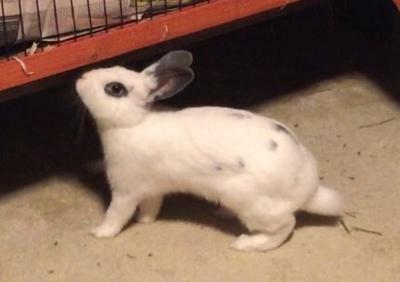 When we first saw the bunny, they called her "Jewel" and the veterinarian's office said she was a girl. We could take her home with us if we would bring her back when she was old enough to be spayed. Shortly after adopting her, the vet's office called saying it was time to take her in. I took her in the night before so they could get her ready for surgery. The next morning I got a call. The girl sounded nervous. "We have some uh, news...while we were shaving Jewel for surgery.... we, found something"
My heart sank, a tumor? Just my luck. I had a flash of a sickly rabbit that I would have to spend thousands on medical bills when we had only just adopted her. "What? I asked apprehensively. I had another confused flash of a strange hermaphroditic rabbit. I was relieved. Why didn't they just say that? "Do you still want him?" Of course I did, I did not care if was a boy or a girl. "What do you want to name him?" Misha does not want to learn to use a kitty litter box. He is feisty and loves to gambol. But he also comes to me and wants to be petted. But he has chewed my chair, my window sill and my sons headphones. He is quite the fun but naughty pet! Depending on his size he is either a dwarf hotot or just a hotot. Seems like a dwarf hotot.